Many cruise ships operate one-off or short-series cruises around the Far East, but if you want a real taste of the Orient, Star Cruises' SuperStar Virgo is the only serious contender. On this ship, East meets West and the join is seamless; must-have facilities for Westerners include jet stream lap pools, a superb gym, an Italian Trattoria and elegant bars that have been given an Oriental twist with richly colored decor, gold statues, karaoke rooms and some of the best Asian restaurants I've ever eaten in (curry fiends will even find the world's first Indian restaurant afloat!). One difference North American travelers will notice is the prolific levying of service fees. The long list of charges for extras on SuperStar Virgo may come as a shock to those of us used to free childcare and cabin service -- but at a current exchange rate of approximately $1.7 Singapore dollars to the U.S. dollar (and $3 Singapore dollars to the British pound), this ship is still remarkably good value for money. That's particularly when you consider the increasingly high prices charged for drinks, shore excursions, spa treatments and specialty restaurants on American and British ships. So: A decent bottle of wine on Virgo costs from $12, liqueurs from $3.50 and beers from $2.90, while a most enjoyable morning's elephant riding excursion in Phuket cost $35 per person. With no gratuity charges and three restaurants offering free Western, Oriental or fusion meals, it's possible to spend less onboard a Far East cruise than you would on a jaunt around the Caribbean. Ultimately, the best thing about SuperStar Virgo is that you're touring Asia with the Asians, eating the local dishes and absorbing the local culture as you go. SuperStar Virgo is one of the most cosmopolitan ships I've ever traveled on -- Indian, Malay, Chinese, English and Australian were just some of the nationalities I spotted on board -- and this cultural mix is very much part of its charm, as you feel you are in Asia even as you cruise around it. Smart casual is the order of the day on this ship; you don't have to dress up (though many passengers do enjoy dressing for dinner) but flip flops and beachwear are quite rightly discouraged indoors. 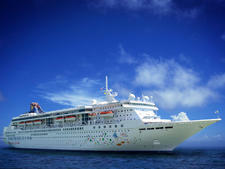 Star Cruises operates a no-tipping policy.